can make as simple or complex as you want. With this system a customer shipping request puts this car forwarding system in motion. 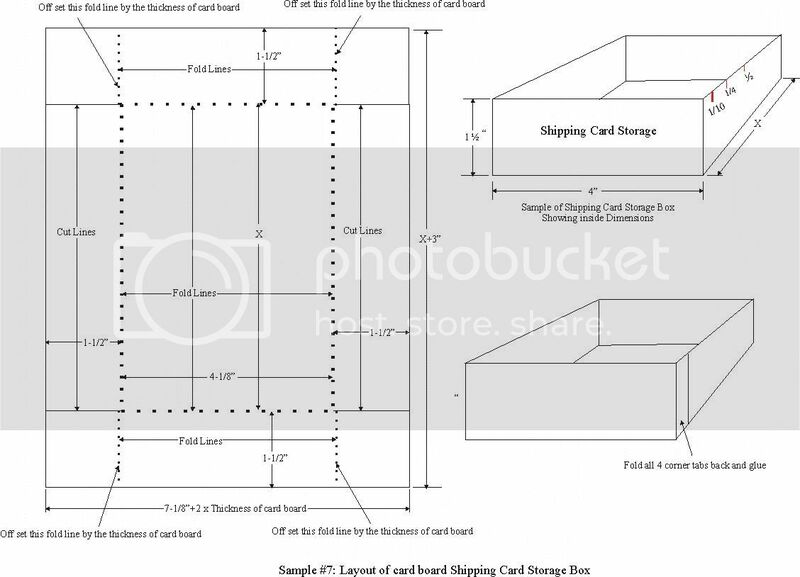 The customerâ€™s shipping request are pre-made cards, randomly stored in a deck of many cards. By pulling a customerâ€™s shipping card, a call goes out to locate a suitable empty car that matches the request printed on the shipping card. The matching empty car should be located in the yards or in storage or in staging or somewhere on the layout. 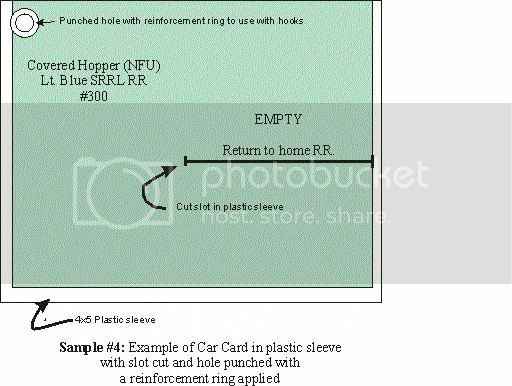 The object is to move the located empty car from its point of origin to the first location indicated on the shipping card to start its journey.Â* A car card that was pre-made and shipping card are combined into what I call a waybill. This way bill system can control from two to five car movements. 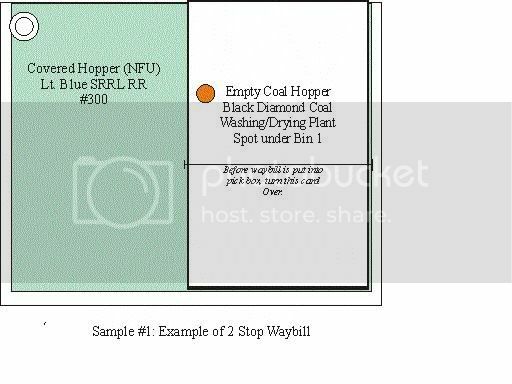 Example 1 One of the simplest waybills: I pull a shipping card. The information I gain from reading this card is, it is a request from Ole King Cole coal distributor, on my layout, for a load of Chestnut size Anthracite coal to be delivered. It seems he is running short.Â* The shipping card tells me to deliver an empty coal car to the Black Diamond coal washing/sizing/drying plant and fill it with coal. Once it is filled, deliver the coal car to my coal distributor, Ole King Cole . After it is empty, return the coal car to itâ€™s original spot. How example 1 works: I know I need a empty coal car. So I look for one on my layout. There seems to be and empty coal car in my yards at the moment. I take the coal car card and attach the shipping card to it. I now have a waybill. The next train that is going in the direction of Black Diamond coal washing/sizing/drying plant will have this empty coal car attached. After the empty coal car reaches the Black Diamond coal washing/sizing/drying plant, it is spotted under the coal bin 1 as directed, to be filled with Chestnut size Anthracite Coal. Two more trains must switch this area of the layout before the car is filled and ready for pickup. The next train that is going in the direction of the coal distributor will pick up this loaded coal car and drop it off at Ole King Cole coal distributor. The loaded coal car will be spotted where the waybill indicates. At that point the car will be unloaded. Two more trains must switch this town area before the coal car is empty and ready for pickup. The next train going in the direction of the empty coal carâ€™s storage area will move it there. That completes the cycle of this one carâ€™s movement. How long did it take before it was received back at storage? At least 8 switching trains worth of time. Do this for 10 or 20 cars and you have a lot of movement. 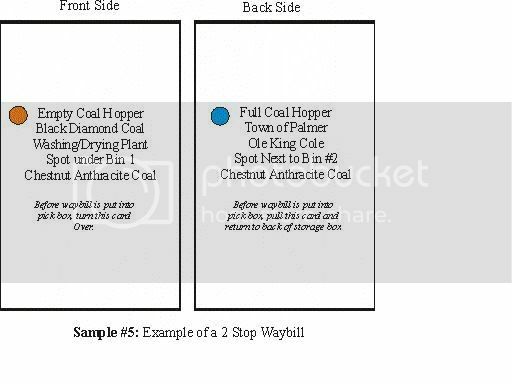 Example 2 is a more complex waybill: I pull a shipping card. The information I gain from reading this card is, it is a request from Rip-torn Paper Mill for the pick up of sawdust from 3 Fingers Sawmill, Holy Plywood Mill and Humpyâ€™s Planning Mill. I need a empty covered hopper (Not for food use) to go to those 3 mills and pick up sawdust and deliver it all to Rip-torn Paper mill. 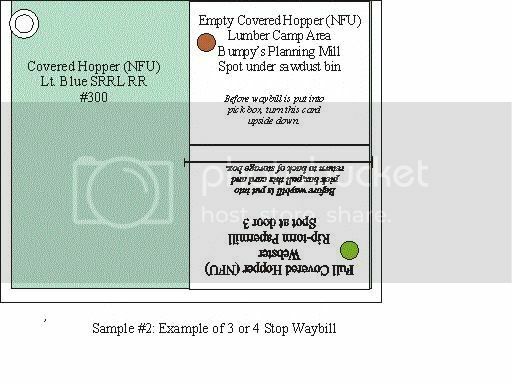 How example 2 works: It works just like #1 except, the covered hopper goes to 3 Fingers where the shipping card is turned upside down where it is directed to Holyâ€™s. At Holyâ€™s the shipping card is turned over where it is directed to Humpyâ€™s. At Humpyâ€™s the shipping card is turn upside down again where is directed to Rip-tornâ€™s. At Rip-tornâ€™s the shipping card is removed and the now empty car is returned to its home. Or just turn the card over again to start the process all over This is the flexibility of this system. How do I make a system like this? There are simpler ways than what I did and I will explain options later on. The first thing I did when designing my layout was to pick some linked industries to go on my layout. Linked industries are industries at will ship goods back and forth between each other, Actually I have quite a few of these interrelated type industries on my layout. This mean not everything has to be shipped onto and off of the layout. I made a list of all my industries, interchanges and businesses on the layout. Even the businesses that didnâ€™t have a spur going to them. I designed each of my towns to have at least a RR storage shed or team track or ramp that the businesses that donâ€˜t have siding can use. I then decided what products would be shipped in and out of each business. I used a 1 year period as a guide for in coming and out going product traffic to cover items that a business might only get once or twice a year. Example: How much machine oil would my sawmill need to order in a year? I guessed, if they oiled the bushings & moving parts twice a day and they had about 3 or 4 hundred bushing and moving parts counting all the rollers on the transfer tables. That would be about a 30 gallon drum of oil a week times 52 week is 52 - 30 gallon drums of oil. That would be about a car load. See, if I used only a month period, my sawmill would never get machine oil and therefore the machinery would breakdown, the saw mill would have to layoff people, the lumberjacks would be out of work. People would move way in search of jobs. Towns would fold up and my trains would have no where to go, the train layout would fall apart, this write-up would be no good. See how things snowball. I used a year also to cover seasonal shipments. Like my potato crop season in Maine that jammed my interchange with the Maine Central for 5 or 6 session. Iâ€™m glad I wonâ€™t see that again for a long time to come. If you know me, this list was quite detailed. I even listed the businesses on my dream future expansion that I was hoping to build at some future point. I then had to estimate how many car loads in a year would the business receive or ship of each particular product. So on the list was the name of the town or switching area. Under the Town was the name of the industry/business located in the switching area. Under each industry/business was a column of incoming products and a list of outgoing products plus how many car load they would ship or receive in a year. If it was a seasonal product, I indicated what months or week this crash demand for cars would transpire. Then I had to determine what type of railroad car was needed to carry each product. If more than one type of car could be used, I listed them. Once that was done I made another list of each car I had. Then I compared shipping and receiving demands with my car list. If I didnâ€™t have a particular car that a product needed to be shipped in, I listed it on a might buy car list. Once you do the comparison it become obvious what cars are going to be in demand. Once I knew how many car cards and shipping cards I would have to make up, I went out and bought a bunch of photograph plastic sleeves that go into photo albums to protect photographs. You can get them somewhat cheap at Walmart. You will need one for each car you have. I picked the ones that hold 4x5 pictures. You can use smaller ones or 5x7 ones. I thought 5x7 was a little too big. I also bought a lot of light colored paper. One color for each type of car I had. I bought a roll of round Â¼â€� stickum dots in different colors or you could use a magic marker. One color for each town, yard, switching area and/or interchange. I also bought a ream, (500) sheets, of heavy white paper and some paper glue. Now comes the most time consuming part, making up the cards. The first cards I up made up were the car cards. I set up my word processor so the it was set to Landscape mode when a page is printed. Then I set up the page so that I could get 4- 4x5 card on one page. I set it up so each 4x5 card would have 2 columns in which to type information.Â* It is not all that hard to do if you use the columns options on your word processing program. I made all the box car cards first, then flat cars, then all the others. I grouped them so when I printed out the page all similar cars were printed on the same color paper. Each car card will have information printed on both left and right side of it. Make your car cards the same size as the plastic sleeve you bought. I picked a font I wanted to use, I chose Times Roman, which is the easiest font to read, I typed Type of car I was making the card for. Such as, Box car, Reefer, Flat car etc. on the first line. I selected a font size that looks nice and easy to read and would fit the information on one half of the car card. A little experimenting was necessary. Line 2 I typed the color and owner of the car. On line 3 I typed the car number. That is it for the 1st car card for the left column. I then spaced down about 5â€� and did the same thing for the next car. After that I hit column break once which put me at the top ofÂ* column 2, which is the right side of the first carâ€˜s card. I spaced down to the line after the car information in column 1 and type EMPTY in a larger point size, next line I typed RETURN TO YARD. You can type where you want the car to go once it is empty such as RETURN TO STORAGE, RETURN TO WEST YARD, etc. Once I had the 4 carsâ€™ information on the screen, I looked it over to make sure ever thing was centered in the columns and was easy to read and made since. 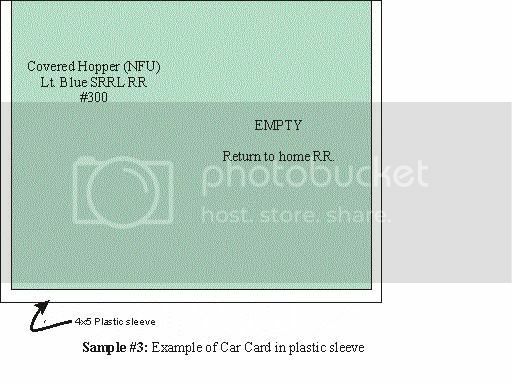 When the shipping card is removed from the car card the words Empty and what to do with the car will be exposed.Â* I then selected which color paper I was going to use for that car type. I used Pink for box cars, Tan for flat cars, Gray for coal cars, etc. I then printed out the page on the color paper. Then I took the page and cut out the four car cards and trimmed them to fit into the 4x5 plastic sleeve protectors. The left half of the car card should have the car information, the right side should say what to do with the car when it is empty. I then took a piece of cardboard about 3x4 and slipped it into the car card plastic protector. Take a razor blade and make a horizontal slot in the plastic. The cardboard should keep the razor blade from cutting all the way through. The length of this cut should be a hair over 2-Â½â€�long centered vertically over the right hand column. At the ends of the slice, cut a small vertical line no more than 1/8â€� high. This should keep the slot from ripping bigger if put under some pressure. When you are done, the cut should look like a stretched out horizontally H with two tiny legs. This makes the pocket for holding the shipping card. When the shipping card is inserted into this pocket, it should cover the directions of the empty car. Once done with all the car cards, I started on the shipping cards. I got the shipping and receiving list and looked it over again one last time. I will be working from this list of the industriesâ€™ shipping and receiving schedule that I made up. Putting together this list was a good exercise because it made me do some research on every business I have or was planning on having on my layout. It also made me name every business. I changed some names and industries around while making up this list up. Not only did I need to research on what products would be coming and going but I had to make up company names for industries that are located off the layout and decide where they were located. I had to determined how and where would the products get on and off my layout. Would it come and go out the north or south branch or would it leave or arrive via interchange that is modeled. I had every shipment going to or coming from a different company. That is where the phone book came in handy. Names, names, more names. 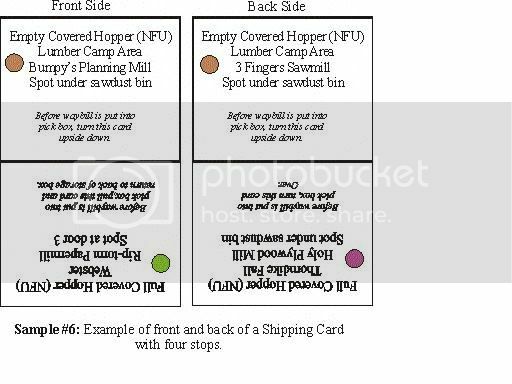 I made the shipping cards to fit on 4â€� x 2-Â½â€� wide card. I set my word processor up so that I could get 8 - 2-Â½â€� wide x 4â€� high cards on one 8-1/2x11 landscape piece of paper. This system allows for a car to move over 4 times if necessary before the empty car moves back to home or yard. Most cars will only be moved twice though. This is howÂ* I made the shipping cards. For a product be shipped, I took industry 1 and typed Empty followed by what type of car is needed. Example: The line could say Deliver Empty Box Car or say Empty Reefer. Line 2 the name of the town that the industry is located. Line 3Â* Name of the industry. Line 4 The location of where the car is to be spotted at that industry. Example: Spot at door 2 or Spot under sawdust bin. Line 5 What is the product being picked-up.Â* Example: 487 cases of prune juice. Then in smaller type I tell what to do with the shipping card and car card. Example: I typed After waybill is put into Pick Box, turn this card upside down. Put waybill on Delivered hook. This all goes on the shipping card. Now is when how many stops this load is going to make needs to been determined. If it will be only the delivery of an empty box car to Industry A to pick up product Z, then deliver product Z to Industry B on layout. Line 1: Type: Deliver Empty Box Car. Line 2 type: The location (Town name). Line 3 type: The name of the industry. Line 4 type: Where to spot the car at the Industry. Line 5 type: What product is been picked up. Then in smaller type tell what to do with the shipping card and car card. Type: Turn this card over after card car is put into pick box. Put car card in Delivered box. On the next card blank on the screen will be the backside of the above card. Type on line 1: Deliver Loaded Box Car. Line 2: Type the town name or area of layout. Line 3 the name of the company receiving the product. Line 4 type The location of where to spot the car, such as door 1 or 2. Line 5Â* type the product being delivered. Then in smaller type you tell what to do with the shipping card. Which in this case will be Remove this card after waybill is put in pickup box and put into back of shipping storage box. Place waybill in Delivered box. This is the front and back of the shipping card. Once you print them out. Cut a 4â€�x2-Â½â€� strip out of the heavy white paper and glue and trim the front and back shipping card to this heavy paper. Take the shipping card and make sure it will slide into the slit you cut into a car card. Make up one shipping card for each car load you estimated would be incoming or outgoing for each product. You can vary the delivery industries or directions the product will go on or off the layout.Â* Lets say you determined that industry A will deliver 50 car loads a year. How many of them will be to Industry B? How many off layout or to industry C? Make up that many product cards. That is what is nice about copy and paste. I remember having to type up my switching cards on a typewriter. I will tell you an easier way to do this later. Ok so we have handled shipping product from industry A to location B either on or off layout. To have product coming in from off layout. You Type the shipping card exactly as the first example except Industry A is located in staging yard or interchange. The back side of the card is Industry B on layout. The product card will direct the product to come in from off layout and be delivered to industry B. When the shipping card is pulled after it gets to industry B and the car will return to staging or yard after the waybill has gone through the delivered, load/unload, and pick up boxes. Now for 3 and 4 stops. Stop 1 the first part will be type exactly as our first example. Stop two will be typed on the front of the shipping card except on the bottom half. When printed out we will cut the two halves apart and glue the second stop on the front side, upside down. The directions on stop one will say Turn the shipping card upside down instead of turn over. At the bottom of stop 2 is where you direct the shipping card to be turned over. On the backside of the shipping card will be stop 3 and/or stop 4. At the bottom of stop 3 you can direct the car be pulled, if there is only 3 stops or to be turned upside down if there is a 4th stop. So if you have 4 stops each side will have one stop right side up and the next stop upside down. You can use color ink on the shipping cards to make special directions or to highlight products or town or whatever. Once the shipping cards are made, take the color dots or a color marker and color code the towns or areas of layout on the shipping card. This will make it easier to quickly see where the car is going. After you make all the shipping cards, you will need to make a box to store the shipping cards in. Mine was 4-1/8â€�wide x 1-Â½â€� tall x whatever length you need to hold all the shipping cards in loosely. I made mine longer than I needed and put in a wood spacer block in case I added more cards. I made mine out of cardboard or you could make this box out of wood. At each town/interchange/yard you willÂ* have to either have 4 boxes that are 2-Â½â€� tall x 5-1/8â€� wide by about 3â€� deep. You can make them similar to how the Shipping Card storage box was made. Or make them out of wood as a set. Or do what I did. 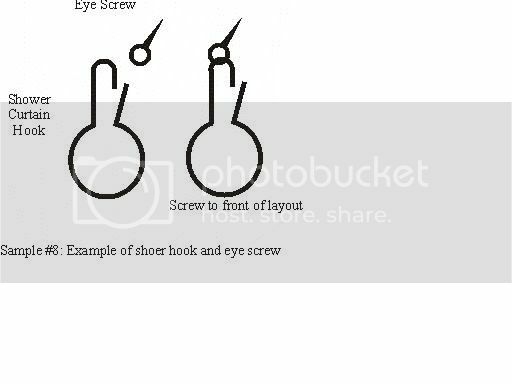 I used 4 shower curtain hooks attached to eye screws. Then screwed the hooks into the front of my layout. Each group of boxes or hooks will be labeled Setout, Delivered, Loading/unloading, and Pick-up. So once you have all your car cards made up and in the plastic sleeves you can punch a hole in the upper left corner of the plastic sleeves with a paper punch, if you are going to use shower hooks with eye screws to hold your car card at each town location or donâ€™t if you are using boxes. I had to go back and put a reinforcing ring around a lot of the holes. You can do that now or wait 6 or 7 month. Mix up all the shipping cards and randomly put them into the shipping card storage box. Determined how many switch moves you want to do and cars you want the train to have. Example: A through freight might have 10 cars to start with, but you only want to switch 4 cars today. You draw 10 shipping cards from the box. Then you locate in the staging yard or storage the number and type of empty cars that will be needed to make up your train. See what your shipping cards call for. After you have locate the 10 type of cars you will need put six shipping cards back into the front of the storage box and keep out the 4 you will be switching. Anyways add the ten cars that were called for to your through freight in the order that they will be set out. Off you go. How I used this system on my layout. My though freight has already been made up and is pulling into town. The first thing I do is look at the waybills that I am carrying to see if I have to drop off any cars here. If there is, I cut them off and spot them on the setout track. Then I look at the waybills on the PICKUP hook and remove any shipping card that tells me too. I then check to see if there are any cars going in my direction. If there are, I locate the cars and add them to my train. I add those carâ€™s waybill to the ones I am carrying for my train. I am done switching this area. But before I leave, I then take the waybills from the LOAD/UNLOAD hook/box and move them to the PICKUP hook/box. I take the waybills from the DELIVERED hook/box and move them to the LOAD/UNLOAD hook/box. I place waybills for the cars I just spotted on the SETOUT hook. I keep doing this at each town or switching area until I am at the end of the run. If I donâ€™t have to switch a town, I still move the waybills along and pick up empties or any car going in my direction that are on the setout/pickup track. The through freight does not switch the industries. That is the peddler freightâ€™s job. When I run my peddler freight, I come into town the same as the through freight. But the first thing I do is look at the PICKUP hook and remove any shipping cards that tell me too. I then determine how many cars are going in my direction and remove those waybills from the PICKUP hook. I locate the cars for those waybills I have and add them to my train. I then take all the waybills from the LOAD/UNLOAD hook and add them to the PICKUP hook and switch those cars to the setout/pickup track. I then take all the waybills from the DELIVERED hook and hang them on the LOAD/UNLOAD hook. Last I take all they waybills from the SETOUT hook and add them to the waybills of the cars I need to spot from my train at this town. After I have delivered all the cars I can from my train and from the setout track, to the spots indicated on the waybills, I place those waybills on the Delivered hook. If I am unable to spot a car where indicated on the waybill, I leave that car on the setout track and add its waybill to the SETOUT hook. At this point I should be through switching this town and move to the next town. Instead of making up all those shipping card you can give directions to place the shipping card only part way back in the storage box. This will still give you the frequency you want and reduce the number of cards you need to make. Example: If your last direction is to put the shipping card only a 10th of the way back in the pack you have eliminated making up ten duplicate cards. Or say Â¼ of the way back in the pack you eliminated make up 4 cards identical cards. You can mark the side of the shipping card storage box where a 10th is, Â¼, Â½, or what ever. See sample #5. You can place special action shipping card is the pack. Special handling such as reefer needs to be iced before the empty is delivered to shipper. If you find that you need more than 4 car movements you can tape two shipping cards together like a book. And just direct what page to turn to after what step. You can keep a car moving back and forth between two or three industries by never removing the shipping card. Another thing, you can introduce is seasonal things by grouping a number of the same shipping cards real close together. Except instead of putting the shipping cards back in storage pack you store them else where until you think they are called for again. Or after the season you put them back in the pack again except close together. So in a year it will happen all over again. If you pull a shipping card and the car called for is not available just put the card back in the front of the storage box. It will keep coming up until a car of that type is available. Over time you will see a trend of which cars you are always short on. When you are thinking about expanding your fleet, you know what type of cars are needed. This system allows you to stop at any time and pick it up later. Or have more than one running trains. It also allows you to limit the amount of cars an engine can pull and not screw up the system. You will have to leave some of the empties behind and grab only the loaded ones. Like they do in the real world. You just leave the empties on the set out track and put the waybills on the pickup hook. You might need to send out a special train to pickup all the empties. You can increase or decrease how much switching you want to do by selecting more or less shipping cards. You can make your shipping cards as detailed or as simple as you want. All you really need on both sides of the shipping card is a car type, where to spot it with the words turn over once spotted. This will keep a car going back and froth. If you want to cut down on the pretend loading/unloading time remove the delivery hook and load/unload hook. Once you spot the car in the correct place put the waybill on pickup for the next train into town. That is what I did when I only had a 3x6 layout. When I expanded my layout, I added the other hooks because I had more towns and areas to switch and store my cars. You donâ€™t need to wait until you have all your shipping cards made to use this system, use it only when you want too. You can also have this system generate a special extra High Ball express unit train with reefers needing to get to market or a coal train extra or a lowly peddler that needs to replenish all the coaling stations. Or a work train dispatched to siding XYZ because of loose track age, so you canâ€™t use that siding for a while. I think its only limit is what you can think up and make a card for it. It will pop up at some point. The shipping card would say Dispatch the work train to siding X. So you make up the work train and move it to siding X and leave it there until you think it should done with its work. If over time if you find one area of your layout is always jammed with cars, then remove some of your shipping cards for that area or add some if an area is not getting enough switching. But watch out, it might be the way the shipping cards were first shuffled. You should go at least twice through the cards before you add or subtract any shipping card because this system tends to even itself out over time. I never removed any cards, if I found that I was switching one area more than I liked I just added more shipping cards for the other areas of the layout. If you can not spot a car at a particular spot because it is occupied, then the car will sit on the setout track until the space is empty. This will space out those two cards in the storage box so this shouldnâ€™t happen again for those two shipping cards. I started this system for my 3x6 switching layout and kept using it as my layout expanded. I know it also works on my friends larger basement size layout also. He appreciated my making up this system for him to use. He and I and our friends have had a few laughs at some of the products I came up with and some of the things the cards have had us do on operating night. So you see if you design your layout around using a system like this, you can have a lot more fun than just watching the train chase its tail. If someone asks why did you switch a covered hopper into a sawmill you will have an answer. Iâ€™m sure there are some things I have not thought of or covered. If this system was or is used by someone else or was thought up by some one else, I am not clamming to be the original developer. I have read about how a lot of card systems work over the years have developed this method that allowed me a lot of flexibility. I might have read this in some published article and not known that I copied it. If so I am sorry. In no way am I claiming this is mine or my idea.